Author Jan Dunlap was suffering increasingly severe bouts of anxiety after a medical misdiagnosis slapped her in the face with an acute realization of the tenuous nature of human life. A degreed theologian, Jan found her personal faith in God and His promises severely shaken and her enthusiasm for life being replaced by growing fear and debilitating insecurity. Then a rescue-shelter black lab-mix by the name of Gracie came into her life as her daughter’s new pet, and Jan determined to do whatever it took to provide both her daughter and the dog with the sense of security she herself no longer felt. She quickly discovered, however, that Gracie had her own agenda, and it was all dog. From chasing squirrels to jumping fences to the occasional roll in dead fish, Gracie taught Jan that life is for living, not dreading. As she began to realize that Gracie was helping her manage her anxiety, Jan also came to a new awareness of how a loving God provides healing through His own works of creation. Part memoir and part medical exploration of the truly healing gifts that God freely offers us through our interaction with animals and nature, Saved by Gracie is a story of God’s redeeming love revealed at the paws of a dog. "Saved by Gracie" was a very emotional as well as inspirational book to read. As a dog lover, I was drawn to the story behind the book as well as the story about the family and Gracie herself. Jan, the author, is from Chaska, Minnesota, which is about a half hour from me, so I felt connected as I read her book in more ways than just being a fellow dog adopter. As she speaks of her experience of bringing Gracie home, and training her, she also finds that she comes to be trained by Gracie. Or, saved. Saved by Gracie just as the Lord has saved her. 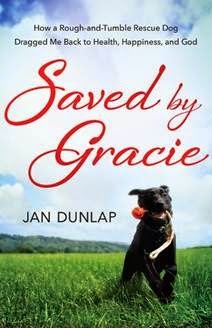 There is a special connection between a dog and it's human, and I urge you to pick up a copy of Jan's book and read about her life-changing experience with her rescue, Gracie. Did you know? Fur-therapy has saved over 40 million Americans who suffer from depression (myself included). At the time, she was also writing a humorous newspaper column about raising her brood of five children and working part-time as a career center manager at a local high school; to help her survive the chaos, she decided to plot murder (as fiction, of course, though it’s been suggested by her children that she might harbor a tiny passive-aggressive tendency – but what do they know, right?). Drawing on her life-long fascination with birds, she began developing a book plot about a nice guy who finds dead people while he’s out birding. In 2008, The Boreal Owl Murder was published by North Star Press, Inc., launching Jan’s Bob White Birder Murder Mysteries (all five of which have been nominated for the annual Minnesota Book Awards). With readers across America and Europe, Jan’s brand of humorous storytelling has earned her accolades from critics and readers alike of all ages (as well as some rather odd emails, but that’s another story). Like millions of people around the world, Jan has suffered from depression and anxiety, and it wasn't until she joined the millions more who own dogs that she finally found relief…and a very effective way to discourage door-to-door solicitors. Relying on her skilled writer’s eye for detail and her clear insight into human nature – along with her trademark sense of humor – Jan tells the story of how Gracie, the shelter dog she didn't want to adopt, helped her recover her emotional, physical, and spiritual health. Saved By Gracie is Jan’s hope that others may regain their health and find renewed joy in life by welcoming a rescued dog into their hearts and homes. A former adjunct instructor for both New Mexico State University and New Mexico Junior College (thanks to her master’s degree in English Studies from Minnesota State University-Mankato), Jan now works as an author full-time. She frequently speaks to book clubs, community service organizations, writers’ groups, birders, and senior living communities about birds, writing, the blessings of nature, and the importance of humor. Jan lives in Chaska, Minnesota, with her husband Tom and (of course) their dog Gracie. You can find further information on Jan's website, and purchase her books on Amazon. You can also follow Jan Dunlap on Facebook, Twitter, and Pinterest.